One of the events that has helped shape and define my life, was the day I walked in to the Denver Shaolin Kung Fu School and signed up for classes. I had actually walked in a few times years prior to joining when I was still a teenager. and again in my early twenties. I did not have my own transportation, much money or an abundant amount of time back then as I was investing my money and time into the Art Institute of Colorado, getting my degree in Industrial Design and Graphics. So for the time even though I really wanted to learn kunfg fu all the way back as far as elementary school watching the 3 O’clock Kung Fu Theater in New York, I had to put aside my passion for learning til later in life. I wish now I had started earlier, but at least I did finally walk in and enroll in the school. It was a whirlwind of different factors that had finally culminated in my joining the school. I had always wanted to study Kung Fu, I always had a facination with the oldschool kung fu movies including 36th Chamber, Drunken Master, etc… and had been looking for a school that had some monkey forms, mantis forms and drunken forms as I had been extremely interested in each of these after watching a few movies that featured the styles prominently. One of the more famous movies that really sparked my interest in the Drunken system was when I watched Shaolin Challenges Ninja (or shaolin vs ninja) There is one scene when Gordon Liu has his friends attack a drunken master so that he can try and imitate and learn the drunken kung fu master’s techniques. I always loved being active in sports that required thinking like skateboarding and Freestyle Bike Riding both of which emphasized learning new progressively harder skills through practice, trial and effort. The same components learning Kung Fu are also made of being that Kung Fu literally means “Mastery through Time and effort” In the end it was my buying of Three new Kung Fu movies that would ultimately have me say that is the school for me! First I bought “Shaolin Mantis” which focused on an alternate story for the creation of the Mantis Kung Fu style which further peeked my interest in this amazing fighting system. The second film was the original “Iron Monkey” with actor Chen Kwan Tai where a young man’s family is killed by the evil Eagle Claw General, the man seeks refuge at the Shaolin Temple where he learns many styles of Kung Fu and then chooses to specialize in the Monkey Fist system. This movie peeked my interest in Monkey kung fu and in the eagle claw system. And finally the movie that sealed the deal was “Return of the 18 Bronze Men” I saw the grace of movement in one of the young men in the movie and his perfect timeing and counter strikes fllowed by a classic line …. after watching the cool action all it took was one line “Master you can’t beat him… the boy’s from Shaolin” I immediately said to myself “that’s it I’m joining the Shaolin Kung Fu School” I then grabbed the brochure I had picked up a year prior from my drawer, read the schedule to see when they would be open, showed up on the next available day and signed up for class. The year was 1996 and I have been loving the training, sparring and camaraderie ever since. The school has a wealth of knowledge that includes every system of Animal style, Internal martial arts like Baguashzang (Pakua), Hsing-I, Tiger style, Mantis, Monkey, The Full Drunken system including drunken weapons forms like the drunken spear, drunken straight sword and drunken broadsword, plus flexible weapons like the 3 sectional staff, and 9 sectional chain whip. It’s actually a bit overwhelming how many forms you learn by the time you are a second black or even by the time you are a first Black belt. The brown belts learn 15+ forms in their year long testing cycle before becoming black belts. The amount of things you learn and the health benefits alone have been amazing including better balance, stronger more agile body, better memory and the ability to defend yourself. All that said the Denver and Boulder schools along with a few other Shaolin Centers across the country have extended a great invitation to new prospective students, One which I am gladly sharing with you as well. 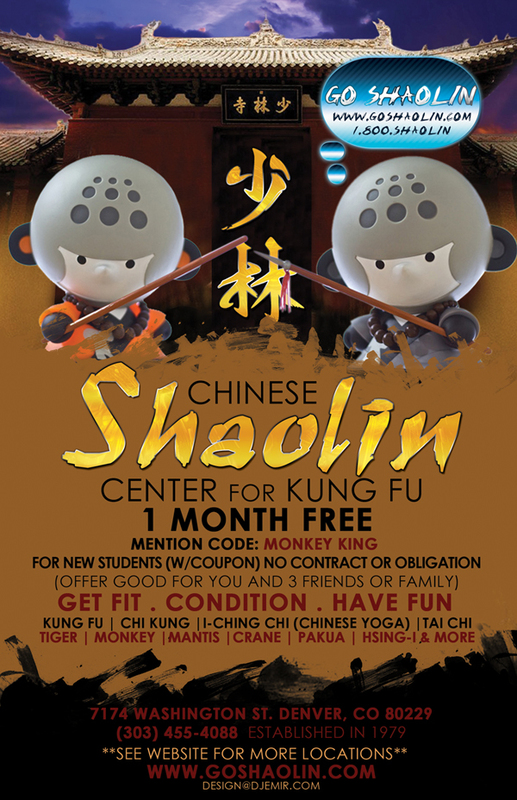 They are offering Yoru first month of Kung Fu Lessons Free for You and up to 3 friends with the coupon below. All I can say is I signed up for a year the minute I could afford it, I was paying $40 per month for lessons and signed up for a year within two months of classes that’s how much I loved it and a year membership brought my price at the time down to only $20-25 per month which is just amazing. I’ve looked at other schools and they simply don’t have as much material and yet charge 3-10 times as much every month. That makes no sense to me. Currently the prices are a little higher at about $40 per month if you sign for a full year or $60 month to month but its still 2-4 times less than other kung fu schools around the country and with One month free there’s nothing to lose except maybe the love handles. I was driving down Hampden Ave. near I25 and instead of heading home on the highway Thu-Le and I decide to go to King Soopers to pick up some food. Some jerk barely cuts us off with no signal and only a few feet of distance and turns immediately into the King Soopers parking lot I was planning on turning into. Naturally with me following the jerk into the same parking lot it looks like I may be following him looking for revenge in the form of a confrontation or fight LOL. The car in front of me veers off to the side and parks in the back section of the lot, perhaps expecting a confrontation or perhaps testing to see what I do. continue past him and park closer to the store. I joked with Thu about how the guy probably thinks I followed him into the parking lot to argue with the guy and start a fight because how he cut me off LOL. Then Thu says “he’s lucky your a nice guy cause someone else might actually do just that. I laugh and said “besides I’m so exhausted right now my punch would probably feel like a plush toy tapping his shoulder.” Then I said “oh look lucky there’s also a cop car in the parking lot.” She responded with “if anything you are probably the most dangerous now… like a wounded tiger (referring jokingly to the Shaolin Kung Fu Black Tiger Form “wounded Tiger”) Just then I saw a familiar looking stature and walk and the profile of what looked like Shaolin student and former State trooper Shawn from the Chinese Shaolin Center. I laughed as Thu and I stepped out the car and said aloud as so Shawn could hear me “speaking of WOUNDED TIGERS it’s the state trooper” He didn’t hear me and was about to step into his car when I approached and greeted him. We talked for a bit, talked about testing and the Shaolin school, I had thought he had already tested to 5th black but he informed me he had two sets of circumstances two years in a row that made it difficult to finis the process. He said he’d been gone for a little bit and I let him know I had returned to Kung Fu myself recently and is expected to test within the next year to 5th black so he has to be in the same cycle since he came before me perhaps we could both work on the material together. I let him know my fear that I will never understand and really learn the Drunken Kung Fu system required to test to 5th black, how I probably only have One of the many forms required in the drunken fighting system and how I’ll probably never learn them in time to test over them. Basicaly there is a long road ahead and very little time to traverse it all. I did mention I have gone been going to Monday night Black belt practice sessions and have been able to easilly go through all my material from lower belt and brown belt to first black so it might be doable to get that material out the way in one of the pretests soon but some of the Black belt material needs a little more work and the second to third and third to fourth black material has pretty much disappeared, including the Hua fist forms that I had practiced so hard to learn and polish for my previous test to 4th black. I told him I had practiced so hard that after the test I said to myself “I need a one month break from these forms” Then life got in the way and that break lasted longer than it should. I’ll never let that happen again, cause it really is true “practice as if in fear of losing it” cause most likely that’s what will happen when you stop. Some of the forms never seem to go away like the Brown belt Tiger form, the Sai Form the third crane form and the Eight Directional Broad sword form as they are fun dynamic forms that flow fluidly without too much repetition and once you’ve tested over them countless times they tend to stay with you always. Thu told us both “See now you both have to go to Shaolin this week for sure, and you have to start getting ready to test.” I agreed. On Monday I went again to practice night and asked myself where should I start? I answered at the beginning of course! I then proceeded to start with all the White belt through Brown Belt material starting of course with the 30 Lohan Short forms. I was able to go through them all easily as far as technique and stance work with the exception of my endurance. By the end of the 30 Lohan short forms I was exhausted, my neck veigns were pumping hard in my throat and my throat was also craving a cold drink of water. Someone asked if I was going over short forms cause I was testing on the pretest this Sunday, I laughed I could probably remember most of my material but I probably don’t have the stamina right now to do the whole test in a row and I probably will have a few spots I may have problems with Once I reach the First Black Belt Material as I no longer have it well polished. I proceeded to get a drink of water hen returned to finish all the other forms and techniques required to test to Brown belt. After that I continued and went over all the Brown belt forms which went pretty smoothly minus a few minor set backs on two of the eighteen forms. No matter what, it’s a small world or at least Denver is a small town, I even mentioned how the previous week I was driving from the Tech Center to Shaolin and there next to me all the way from the Tech Center to Spear Ave was 5th Degree Black Belt, Master Derick driving alongside me LOL. Small world, small city.